I rarely review a food (as oppose to an eatery) but I do occasionally do so whenever I found that a particular food has caught my eyes (hence the reason why I created the 'Local Food Trends' aka LFT category). So behold people… the Ais Krim Pasu Bunga (yes, drama as always)! Directly translated as ‘the Flower Pot Ice-Cream’, it is exactly what you think it is. I know this dessert might not be an original idea since I did saw a couple of similar looking dishes in several places inside and outside of Tawau. If you’re interested in trying some, make sure you get yourselves to the Hilltop area. It’s surprisingly in an area right in front of the Hilltop rows of shops, where a cluster of ‘warungs’ are situated. It’s available at a place called Warung Hjh Senang, right next door to arguably one of the most well-known warungs locally, the Warung Nina. Although I think that the creativity behind said dish was impressive, I do however am less impressed with the taste. Overall, the ice-cream lacked taste (it’s almost to the point of tasteless, which was surprising since it’s an ice-cream for crying out loud) but the condiments that completed the ‘flowery look’ on top of the pot were flavourable. Hey at least it contributed a bit to the taste right? And if you’re wondering whether you can take the ice-cream to go, well I’m sorry to disappoint you guys but it’s strictly dine-in only. But if you’re not really into the ice-cream, have no fear since the warung also caters other types of food such as typical heavy duty food (like the Mee Goreng Mamak I had – which was very good) and favourite tea time munchies such as keropok lekor and pisang cheese. With the current hazy and pretty scorching hot weather, we obviously craved for something sweet and cold. And as if God has answered our prayers, there’s a new froyo (frozen yogurt for those less familiar to the term) establishment in town, and dare I say the first as well. Let’s get the location out of the way so we can move on to the actual food yes? 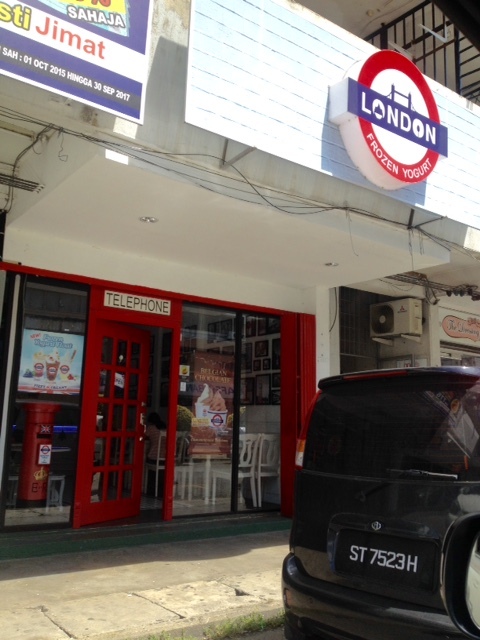 It is situated at the CTV Junction, the single row of shops at Jalan Chong Thien Vun (in front of a Chinese restaurant called Cynthia Restaurant), and in the same row as the Wukka Cafe. I admit that I was a bit puzzled as to why the tiny shop was named after one of the most famous places on Earth. But as I entered the shop, I began to realize why when I noticed their interior décor, which was 100% London themed. Maybe the owner was very fond of the place? The cosy and laid back atmosphere did help a lot at easing you into the place. As for the froyo however, it might not be ‘there’ yet for the time being. There are currently selling only two flavours per month; this month’s special being the Fruit de la Passion (aka passion fruit) and the Vanilla+Passion fruit mix. You can choose one of the flavours and then add a topping of your choice (there’s a sizeable choice for that so don’t worry – it’s kinda like that Tutti Fruitti franchise). As of now, the price is at RM5.90 but if you wish to add more than one topping onto your froyo, then it will cost you RM1.00 per topping. Me and my partner chose to have both flavours and although I expected it to be sour (I took on their full on passion fruit flavour), I did not expected it to be that mind-blowingly sour (and I don’t know whether I like it that sour though). I really hoped that they will consider adding permanent staple flavours into the mix such as the ever popular chocolate. Updated on 24/01/2016: We'd dropped by again recently and tried out their Blackcurrant flavours and I'm sorry to say that it still tasted sour to me... Maybe it's my taste buds? Updated (again) on 14/12/2016 - This time around we'd dropped by their other branch at Fajar Complex to try out their (long awaited) Belgian Chocolate flavour & dare I say that they had finally won me over! but it's a bummer that I'll only be able to taste this flavour temporarily (sigh). Oh my God! It’s been literary ages since the last time I took any type of ‘personal time off’ from my ever hectic work. So during the recent break (the TYT of Sabah’s birthday if I’m not mistaken), I pretty much checked myself into another local establishment for some ‘me time’ and this time around I choose My Inn Hotel. The hotel is located at Jalan Dunlop (within the Sabindo old town area), in front of a now defunct cinema called the Empress. If you ever get hungry in the middle of the night, there’s a KFC at the ground level of the hotel, as well as a Guardian store and a lot of other various shops nearby. But let me warn you though, parking is almost impossible to find within the immediate area especially during weekdays. Now the main reason why I chose this hotel this time around was the fact that the price was ridiculously affordable. So for such price, I wasn’t expecting much out of the room. But I admit that I was pleasantly surprise to find that the room was pretty satisfactory. The room was spacious (more space than I initially thought) and they actually attempted to make the room looked modern and homey at the same time. A very comfortable room indeed with a decent bathroom and shower. And even though the reception area was on the 1st floor (the ground floor only served as the entry way to the upper floors) rest assure that the surrounding area on the ground floor has the secure and clean feeling, unlike any sleazy types of establishment. Apparently there’s a new hangout spot in Tawau and it is called the Taipan Commercial Centre. I swear, whenever I drove passed this relatively small sized commercial area, cars were just piling up the place. And it’s no wonder because the place (although small) houses a few really nice places to eat. And I’ll start off my personal Taipan list with the very obvious choice (and very hard to ignore)… the Pizza Hut. Yes folks, this is my second entry of the beloved fast food chain (the previous one featured their Fajar branch). I don’t have much to complaint about their food. We still love their slew of promotional pizzas (the Signature series were just lovely) and other notable side dishes such as the BBQ Chicken Wings and Mix Platter. We even ordered their Tempura Prawn Garlic Rice and it’s surprisingly good too. But what really bugged me was when they started to add additional ‘service tax’ on top of their GSTs. Look, it’s not that I don’t’ understand their ‘situation’ and that KFC had also implemented the same charges (which was even dumber since it’s a self-service joint) but it really blows though. But hey, you just got to bear the price especially if you’re craving for some piping hot pizzas right? Gaining momentum as of late, this new kid on the block establishment has been making rounds in the local social media scene. But it might be a bit tricky to spot them, as it is well ‘hidden’ within Taman Ria 6 (it’s on the single row of shops within the housing area, next to a bakery called Najwa Bakery & the Roswad shops). And don’t be alarmed (or taken aback like me) when you arrived at a really small place (really, it’s tiny by any café standard) with no clear signage on top of the shop (because that is what you’ll eventually encounter of course). Even though the seating were pretty limited, the décor however was very interesting for me. It’s pretty clear that the owner is a huge fan of the rock & roll era, with numerous drawings and memorabilia from famous artists such as Elvis Presley, James Dean and Marilyn Monroe. But enough with the décor and lets dive straight to the good stuff. The eatery mostly provides western food, with a couple of local dishes thrown in for good measures. I’ve heard a bit about their Grilled Chicken Chop so I tried that one. It’s surprisingly delicious and comes in an even ‘delicious’ price (around RM8.90 if I’m not mistaken) but with a slightly smaller portion in my opinion. My partner was not in the mood for anything western and opted for their Chicken Fried Rice (or something). Despite the plain look, my partner gave two thumbs up for the taste. We also got a bit greedy and decided to share a plate of Beef Spaghetti Bolognese and as you can see in the pic below, it's literally flooded with yummy sauce. 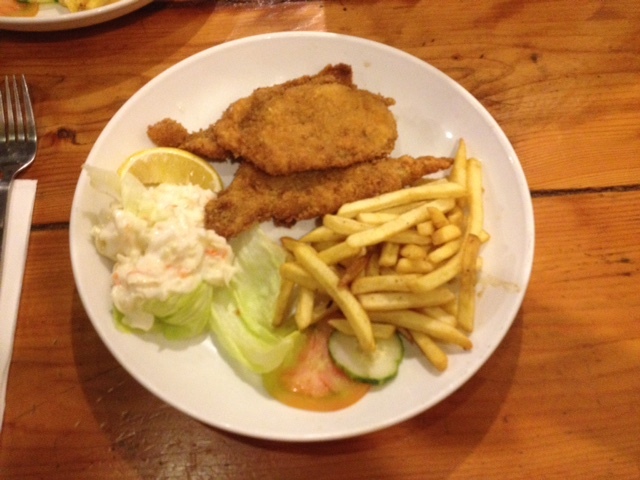 Updated on 16/02/2017 - On our recent visit, their dishes has shown some improvements especially in terms of portion (my Fish & Chips below as evidence). Kudos to them!